Bing Comic-Con, Springfield, Massachusetts best one-day event. 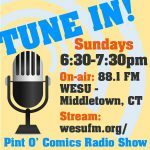 Pint O’ Comics will be there. Will you?